Farmers may be handling more money, be we aren't making more money. Especially not in a drought year. Earlier this summer, I had the pleasure of sitting around the Martin Family Farm office with Doug and Erin Martin. Doug and Erin are excellent young farmers from the greater Mt. Pulaski area, and they farm with Doug's parents. Always thoughtful, Doug shared that they've spent more time this past winter thinking about what's ahead in agriculture and how it will affect their farm. And as he spoke about market volatility, he verbalized very well what a lot of us in agriculture have come to realize: "We handle a lot more money. We don't necessarily make more money." So very true. And it reminds me of a scenario with our non-farm babysitter of a few years back. She happened to be standing at the counter as I wrote out a $40,000 check for seed. She was shocked. Amazed. Like a lot of people, her family didn't write checks of that size. We kinda take it for granted, because we've gotten used to the volume of money that comes in and out of a small business. And in the agriculture business of the past five years or so, the volumes (and checks) have gotten bigger. Higher grain prices have brought fertilizer and input prices higher. Land is selling between $10,000 and $12,000 an acre in a whole lot of places. All the numbers are higher. All the risk is higher. Occasionally the reward is higher. And some years, there's a drought. Upshot for 2012? Lots of risk. Significant potential for very little reward. And as Doug pointed out back in May, 2010 and 2011 were mediocre crop years for them. Yet at this point in early July, they may look a whole lot better than 2012. Still, he's optimistic. He and Erin like farming ("obvs," as the kids say). They like raising their family on the farm. But as a thoughtful farmer manager, it's the volatility that makes him start to think about pulling in the reigns a bit. 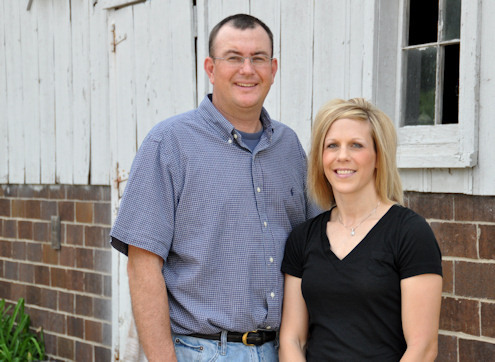 For more on Doug and Erin's take on what's coming in the next 10 years in agriculture – and what they're doing now to prepare their operation – check out the July Prairie Farmer, pages 8, 9 and 10.